We used Splash Math for around 30 minutes every day. 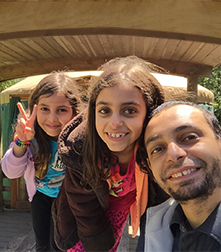 Consistency is very important for kids, and doing math daily allowed Mariam to grow her skills in math in no time.What Mariam likes most in Splash Math is that she can choose the skills that she will practice, and do them at her own pace. If she got bored or stuck from one skill, she can move to the next. We were using math workbooks mostly for practice, and we used to print some math drills for the math facts from the internet. We used other apps to improve timing as well, like quick math, but for the real practice with levels, Splash Math was our go to app. Splash Math doesn't provide an explanation for how to solve the problem, so we still have to use other sources and books for the explanation part. One of the biggest advantages of Splash Math over another learning method is the fact it works offline, so we can use it for road trips or even on our way to school while I'm driving. Yes, we saw noticeable improvement. Kids must practice math regularly so if Splash Math works for them, then try to be consistent with using it. Practice makes perfect.